The R If Statement is the basic decision-making statement in real programming world. It allows the compiler to test the condition first, and depending upon the result it will execute the statements. If the test condition is true then only statements with in the if statement is executed. From the above code snippet, If the Boolean_Expression / test condition inside the If statement is true, then the statements (Statement 1, Statement 2,……., Statement n) will be executed, otherwise all those statements will be skipped. Let us see the flow chart for better understanding. 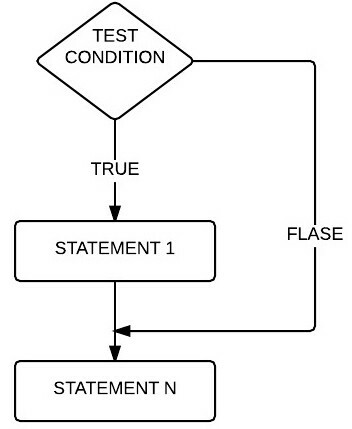 If the test condition is true, STATEMENT 1 is executed followed by STATEMENT N.
If the condition is False, STATEMENT N is executed because it placed outside of the if condition block and it has nothing to do with the condition result. Let us see one example to understand better. NOTE: If statement in R Programming does not required the curly brackets to hold single statement but, It is always good practice to use curly brackets. From the below screenshot you can can see that, we entered 25 as number. This program will check whether 25 is greater than 1 or not. We all know that it is True, program is printing the text inside the print(). Let us change the number value to check what happens if the Boolean expression fails? (number < 1). From the above screenshot you can observe that, it print nothing because -12 is less than 1 and we don’t have anything to print after the if statement block. Hope you are confused, let us see one more example. You can observe from the below output, it printed all the print statements because 14 is greater than 1. Let’s try the negative values to deliberately fail the condition in R If statement. Here, Boolean expression inside the R If statement failed (number > 1). That’s why it print nothing from the If statement block but it printed the statements outside the If block.